Unlock a whole arsenal of optional, missable weaponry in The Evil Within 2 with all the gun locations. Like any proper survival horror adventure, your weapon is your life — and the more guns you’ve got, the easier you can survive in the twisted town of Union. Early on, you can grab an upgraded pistol, a multi-functional crossbow, and a broken Sniper Rifle that requires a quick repair job to get working. That’s just a few of the extra weapons available. You’ll find a variety of handguns, rifles and shotguns as you explore — weapons you’ll need to fight hordes of twisted freaks generated by the diseased minds in control of the STEM system, a mental landscape populated by serial killer artists and psychopathic priests. Make life easier on Detective Castellanos and don’t miss out on any of the weapons with these locations. 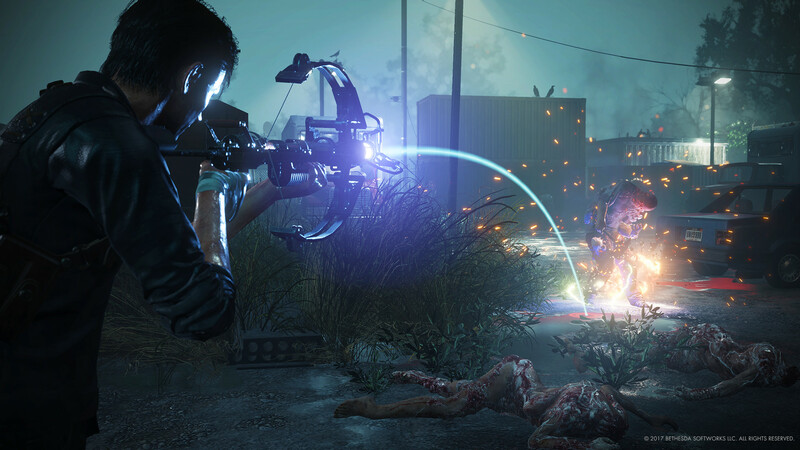 Like in The Evil Within, you’ll progressively locate and unlock more weapons in The Evil Within 2 as you complete chapters. Some weapons can be missed, or must be unlocked by other means — here, we’ll detail every weapon and how to get it. The more weapons, the merrier. In the Residential Area of Union, follow the quest marker to the Auto Repair Shop in the northwest corner of the map. Circle around to the gate behind the shop (through the parking lot) and break the chain. Use the blue crate to hop the fence and check the burning car. There’s a dead body carrying the Laser-Sighted Handgun. When picking it up, an enemy will ambush you — grab it off the ground to collect it. To the left of the safe house, there’s a tall brick building. Reach the rooftop using the exterior stairs and ladder. You’ll find the Broken Sniper Rifle first. To repair the Broken Sniper Rifle, go to the garage in the northwest corner of the map and collect the Sniper Rifle Parts. Now you can use the Workbench to repair the Sniper Rifle. The sawed-off shotgun can only be acquired in Chapter 3. Accept the Side Mission “Rogue Signal” and follow it — you’ll eventually interact with a computer in a basement, taking Sebastian to the Marrow Armory. Complete the linear underground section and you’ll eventually reach a weapon case with the Sawed-Off Shotgun. Chapter 4 takes place largely on the same map as Chapter 3. Go to the southwest corner of the Residential Area map. There’s a Mobius military truck with a dead soldier pinned to a crate with an arrow. Collect the extra arrows and the Warden Crossbow from the crate. You use can use Crossbow for stealth kills or to set traps for hordes of enemies. Rescue Sykes from the Parking Lot in the center of the Residential Area map. There are two Side Missions you’ll get from him — “Out In The Open” and “Getting Back Online” — talk to him in the Safe House to unlock these extra Side Missions. The Silenced Handgun is your reward for completing both quests. After completing the small Marrow sub-area, Sykes will unlock a weapon container in the Safe House with the Silenced Handgun. The Long-Barreled Shotgun is located in a locked shed south of the Post Plus Safe House in the Residential District. It can also be acquired in Chapter 13. To enter the shed, you’ll need to collect the key from the Residual Memory / soldier corpse in the south. The key is located down an alley near the Devil’s Own Taproom. At the far end of the alley, past a pile of dead bodies, there’s a Mobius APC and a dead soldier. Grab the key, then go to the storage shed directly south of the Post Plus Safe House. It’s the first building below the safe house on your map. To collect the Classic Revolve Handgun, you’ll need to activate three separate Anima events. Anima events are special, optional encounters with a ghostly creature. It can’t be killed, so you’ll have to sneaky by to escape. Chapter 3: The first Anima Event is triggered in the spooky house in the Residential District. From the northern safe house, go south down the neighborhood street and enter the third hour on the right. Collect the file inside to activate the first event. Chapter 7: The second Anima Event is in the Business District. Find the abandoned Diner and scan the memory in the kitchen to trigger this event. Chapter 11: The final Anima Event is in the underground laboratory. In the large two-story chamber where Sebastian needs to collect a chip to get through the locked door, look to the right wall for a broken panel. Shoot the panel with a Shock Bolt, then enter the office and inspect the file at the end of the hallway. If Sebastian completes all three Anima events, you’ll unlock the Revolver Handgun. To get the Flamethrower, you’ll need to kill the boss at the end of Chapter 11 and collect the Broken Flamethrower off his body. You won’t be able to repair the Flamethrower until Chapter 13. In Chapter 13, you’ll need to defeat 2 Harbinger enemies to collect the Flamethrower Fuel Tanks you need. One is near the starting safehouse, and the second can be found south of the safe house near the Diner. Harbingers are easy to spot — they’re the masked psychos wielding flamethrowers. Once you kill two, you can field craft the parts to create the complete Flamethrower. Take the Flamethrower into Chapter 14 and use it on Laura to earn the “I’ll Take You Down Myself” achievement / trophy. To get the Double-Barreled Shotgun, you must save Sykes and complete his Side Mission “Getting Back Online” in Chapter 7. If you do, Sykes will give you another Side Mission in Chapter 13 — “The Last Step”. It will automatically unlock on your communicator. Check for signals in Chapter 13. After completing the Side Mission, Sykes will escape in a pod. Wait for the smoke to clear, then collect the Double-Barreled Shotgun in the corner. This one is hard to miss. In Chapter 13, a certain character will die and leave you the Assault Rifle in The Marrow Safe House. Pick it up before leaving Chapter 13 and moving on to Father Theodore’s Stronghold. Reward for completing the main story.